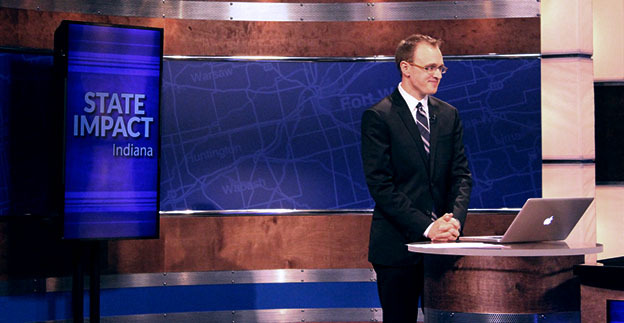 Kyle Stokes joined WFIU/WTIU in 2011 as an education reporter and blogger for StateImpact Indiana, a collaborative reporting venture between WFIU and NPR News. He comes to Bloomington from Columbia, Mo., where he was a producer and reporter for NPR member station KBIA-FM and NBC affiliate KOMU-TV. Originally from Minneapolis, Minn., Stokes is a proud graduate of the Missouri School of Journalism and an even prouder Minnesota Twins fan. Cannelton City Schools superintendent Al Sibbitt drives down the town's main drag, pointing out shuttered stores and businesses. Over the past decade, academics and political leaders have delivered a consistent message to Indiana’s smallest school districts: If possible, consolidate with a nearby district. Recent Ball State research says half of the state’s school districts could reduce costs through a merger. Yet only a handful of schools have actually done it — in part because pressing financial need sometimes isn’t enough to drive consolidation. Halfway between Louisville and Evansville on the Ohio River are two small cities: Tiny Tell City, Ind., and the even tinier Cannelton. 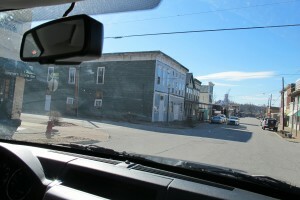 Cannelton’s only three miles upstream from Tell City — but it can seem like it’s worlds apart. I was telling this guy at a social occasion what I did for a living — that the work was invigorating and interesting, that I hoped it was making a difference, that I loved my job — when his eyes narrowed. I knew what this guy was thinking, though he didn’t have to say it. He assumed I spent my days covering choir concerts, bake sales and school plays. Education — a low-impact beat. This guy hasn’t been to Indiana lately. A higher business personal property tax, argues economist Scott Drenkard, would incentivize a bank in need of an ATM, for example, to "hire a bank teller — even though it doesn't make any economic sense." StateImpact is featuring conversations with experts from two national think-tanks on the state’s proposed business personal property tax cut. Read our interview with an economist who opposes the cut here. 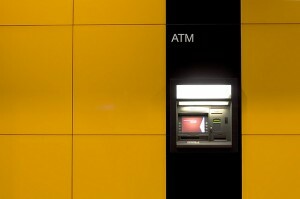 Imagine a bank, economist Scott Drenkard says, that wants to purchase an ATM machine. In Drenkard’s hypothetical example, the ATM costs $30,000 per year to buy and maintain. It’s also business equipment, meaning the bank will have to pay Indiana’s business personal property tax on that ATM. “Hire a bank teller for $30,500 a year,” Drenkard says. “If the business personal property tax is higher than $500 a year, you’re going to hire the bank teller even though it doesn’t make any economic sense” — after all, the teller won’t dispense bills at any hour of any day of the week. Business equipment tax revenue pays for many of the same school district expenses property taxes fund, such as busing. If Indiana lawmakers decide to scale back the state’s tax on business equipment, they’d follow half-a-dozen other states where lawmakers have already eliminated the tax entirely. This graphic shows the distribution of Indiana students' scores on the AP exams they took relative to the states that border Indiana. More than twice as many Indiana students took an Advanced Placement exam in 2013 than in 2003, but the percentage of the state’s students scoring high enough to earn college credit still lags the national average. That’s one takeaway from a report released Tuesday by officials at the organization that administers AP tests to high schoolers across the country. The graphic above tells much of the story: smaller proportions of Indiana students are earning scores of 3, 4 or 5 on the exam — the scores that are generally good enough for college credit — than in neighboring Illinois, Kentucky, Michigan or Ohio. Gov. 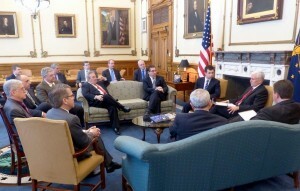 Mike Pence met with several Indiana mayors on Tuesday. His office's Twitter account posted this picture that afternoon. Gov. Mike Pence is “open” to using state dollars to replace the roughly $54 million* local governments and schools would lose if state lawmakers were to exempt small businesses from paying a property tax on their equipment, as an Indiana Senate bill proposes. “This would ensure that any reform of this tax does not unduly burden local governments or shift the cost of this tax onto hardworking Hoosiers,” Pence said in a statement Tuesday. The governor also touted the benefits of a separate Indiana House proposal that would give counties the option to stop taxing newly-purchased business equipment. 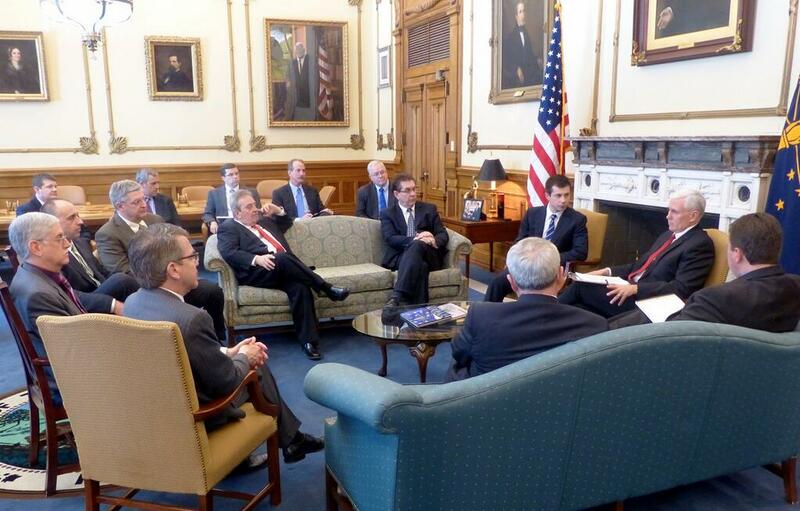 Pence, who opted against discussing details of the proposed business personal property tax cut last week, made that announcement after meeting with several Indiana mayors Tuesday afternoon. Officials in Indiana cities and towns have asked lawmakers to back down from their proposal; the tax rakes in $1 billion annually for their local governments and schools. 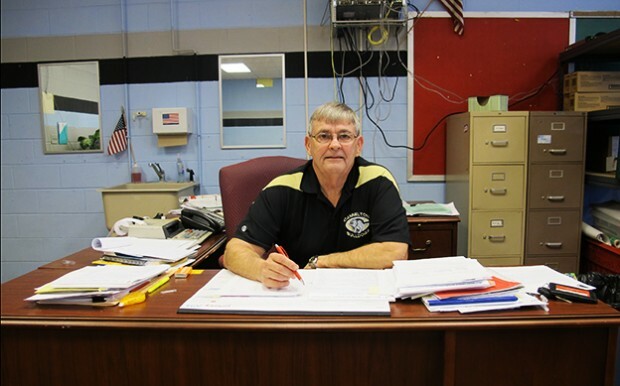 Cannelton City Schools was in 'complete disarray' when Al Sibbitt took over two years ago. The 72-year-old part-time superintendent has had to implement steep cuts to keep the district going, but revenues are still drying up. At 72, Al Sibbitt doesn’t need to be working. But his part-time job still keeps him up nights. When he took the job two years ago, Indiana’s smallest school district already had big financial problems. As if Cannelton’s declining enrollment weren’t problematic enough, the state’s Attorney General filed a lawsuit in 2012 against Sibbitt’s predecessor, who may have misspent more than $615,000 of the district’s money. But on top of that, Cannelton has lost more than half of its local tax revenues to the state’s property tax caps. Proportionally speaking, only three Indiana districts have lost more to these constitutionally-enshrined limits on how much property owners pay to local governments. 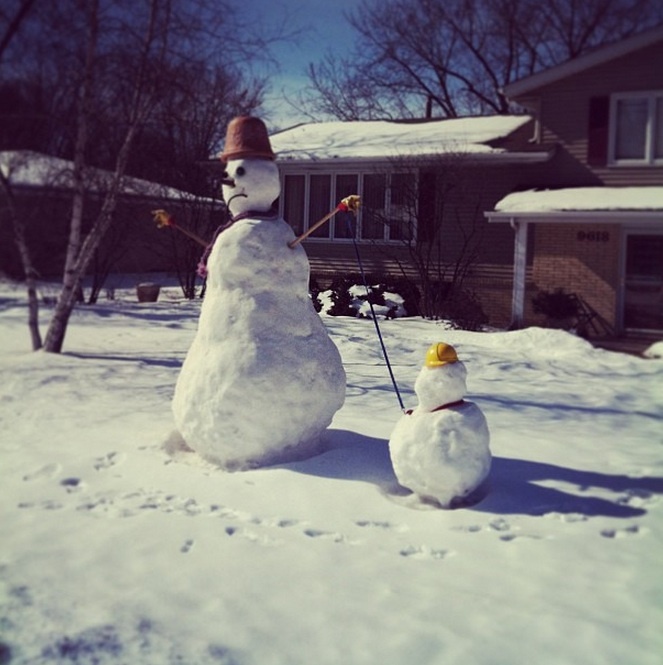 When Schools Lose Days To Snow, Is Making Up Lost Time An Adequate Substitute? 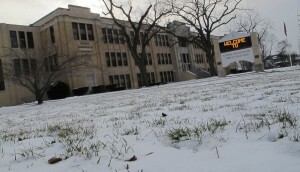 The first snowpack of the winter on the front lawn of Indianapolis' Washington High School in 2012. Compared to last year, harsh winter weather has prompted Indiana districts to cancel or delay classes on more than twice as many days this school year, if an analysis by our colleagues at WTIU News is any indication. State officials are now looking for ways to relieve the strain the closures have placed on schools’ schedules. At the State Board of Education meeting last week, superintendent Glenda Ritz announced a novel solution: Allow schools to adjust their calendars make up snow days hour-by-hour, rather than day-by-day. In other words, as Chalkbeat Indiana‘s Scott Elliott puts it, a school could make up one cancelled six-hour day by adding an hour to six later school days. From a research perspective, judging whether adding an hour onto six school days is equivalent to one extra day of student learning is tricky. Indiana schools have cancelled or delayed classes because of weather an unusual amount of time this winter. Last year, it was a problem with Indiana’s online testing service. This year, it’s cold and snowy weather. After unusual numbers of school closures and delays this winter, state Board of Education members voted Thursday to give Indiana educators seven additional school days in March to administer the state’s benchmark standardized tests. Schools will still be able to begin giving students the non-multiple choice parts of the ISTEP+ exam on March 3. But instead of wrapping up on March 12, the testing window will now close on March 21. State Board members also voted to add two days to the window for the third grade reading exam, the IREAD-3, which will be open from March 17-21. This map shows how much of each Indiana school corporation’s local tax levy was lost to the state’s property tax caps in 2013. Note: Indiana’s Department of Local Government Finance does not have property tax cap data for LaPorte County, accounting for the gap in the map there. Most school districts’ losses to Indiana’s property tax caps, which we’ve been discussing at great length recently, only amount to a drop in the bucket. But as our brand new map shows, the 50 or 60 districts that have lost the largest shares of property tax dollars to the caps come from all over the state, featuring enrollments large and small. What the map doesn’t show: The caps’ impact has grown since their debut. Property owners statewide got to keep more than $245 million last year that would’ve gone to school corporations if not for the caps — up $100 million from 2010.